These notes make little sense out of context. However, I save almost everything that I write or think about in writing. These wqere some notes (with lots of attached digital studies to back up my thoughts) in 2010-2011. I originally kept track of all of this, because I was trying to figure out the best way to explain solid course design from the perspective of UI/UX commonly associated with social media and gaming. That was pretty much a failure, but I was able to plant the germ of thought around these concepts with several individuals who had never thought about the motivational or social constructivism that should be a part of learning online (the same way these play such a vital role in face-to-face instruction). When I write things down, I tend to really remember them, even if I don’t return to the notes. Each of the studies or books contained in the notes have been read and considered prior to adding them to my thought process. Wang, N., Johnson, W.L., Mayer, R.E., Rizzo, P., Shaw, E., & Collins, H. (2008). The politeness effect: Pedagogical agents and learning outcomes. International Journal of Human Computer Studies, 66, 98–112. Mayer, R.E. (2005). Principles based on social cues: Personalization, voice, and image principles. In R.E. Mayer (Ed. ), The Cambridge handbook of multimedia learning (pp. 201–212). New York: Cambridge University Press. Moreno, R., Mayer, R.E., Spires, H., & Lester, J. (2001). The case for social agency in computer-based teaching: Do students learn more deeply when they interact with animated pedagogical agents? 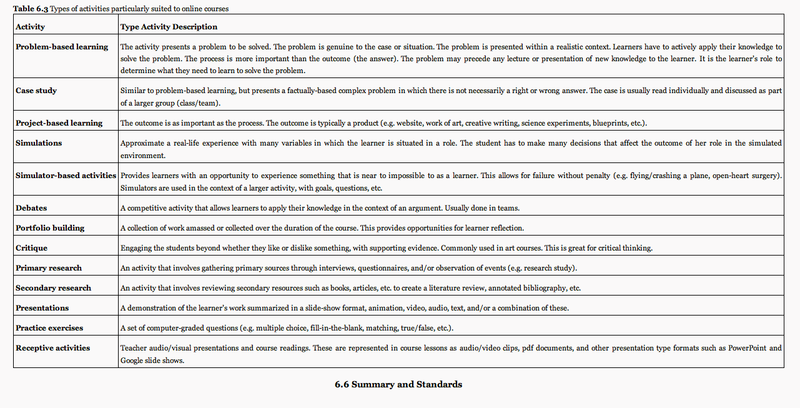 Cognition and Instruction, 19, 177–214. 3. Last text and cover attachments include a short couple of pages from e-Learning and the Science of Instruction: Proven Guidelines for Consumers and Designers of Multimedia Learning [Ruth C. Clark, Richard E. Mayer]- Breaking all sorts of copyright rules here…(and this is not a part of our coursework here in ID…but, this is an important book synthesizing these ideas and used at other state universities, like USF and UCF). Really great, innovative design takes lots of work. Simplicity is so complex. These guys rock at it. Social networking can be leveraged as a tool to promote deep communication and learning between learners and as a way to validate accomplishments of those learners. Badging and the curating of shared knowledge within this network (participants’ shared knowledge may be examples of lesson plans, videos, blogs, photos from the field, etc.) is a powerful way to building a structure that allows for meaningful learning in an online environment. This shared responsibility for curating the uploaded artifacts helps to motivate the learner and can be used to help assess the contributions and the outcomes of applied learning for every participant. I have attached Baker’s 2007 AERA published paper as the “touchstone” document from which a great deal of research has been based. Rogers, Everett M. 1962. Diffusion of Innovations. Glencoe: Free Press. Most recently revised 2003 (5th edition).